Santa Claus is making a special appearance at the Chicago French Market for Jinglefest 2012, 11 a.m. to 2 p.m. December 15. This fun filled family event features an opportunity for kids to have their picture taken with Santa. Alan Jania a children’s author, also will be reading from his book The True Tale of Dasher (available for purchase for $19.95). To end on a sweet note, there will be holiday cookie decorating for kids. This fun event is sponsored by the Chicago French Market vendor Vanille Patisserie. Prairie Grass Cafe New Side Dish an Unlikely Favorite? We’re quite certain that one of the reasons the Brussels Sprouts at Prairie Grass Cafe are outselling all other side dishes is that they are paired with bacon – a combination made in heaven. 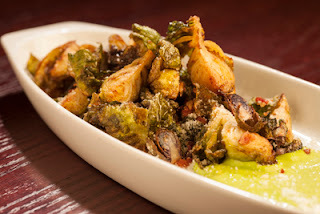 The delicious dish is described as Crispy Brussels Sprouts with Local Bacon and Parmesan Cheese ($7) is served with a yummy Basil Remoulade. It’s not only a customer favorite but one of chef/owners Sarah Stegner and George Bumbaris. If you’re looking for a great holiday side, consider this winner from Prairie Grass Cafe, 601 Skokie Blvd., Northbrook, IL (847)205-4433. Buen Apetito debuts new dishes to its authentic Mexican menu. The family-owned taqueria prides itself on bringing customers traditional Mexican favorites with a modern flair. The new menu items provide a greater selection for market diners. The Tilapia Plate ($9.75) is topped with lettuce, tomato and ranchero sauce and is served with a side of rice and beans. The Vegetarian Plate ($8.25) is filled with fresh produce including red and green peppers, zucchinis, portabella mushrooms, onions, rice and beans. Buen Apetito also has introduced an assortment of Enchiladas including: Succulent Steak, Savory Chicken, Sautéed Salmon, Grilled Tilapia, Sizzling Shrimp, Vegetarian Delight, and Cheese, available for $2.50 to $2.95 each, accompanied with red sauce, cheese and sour cream. Or try the Enchiladas Supreme which adds lettuce, tomato and avocado for $3.25 to $3.70. Kids visiting Westfield Old Orchard are in for a special treat this year. Maggiano's Little Italy will be hosting Breakfast with Santa, 9 a.m. to 11 a.m. December 8. Santa will be jolly and ready to read a special holiday story and visit with the kids. Additional activities will include face painting and a performance by the Niles North High School Choir. Breakfast will be a delicious buffet of pastries, fruits, eggs, sausage and beverages at $14.95 a person. Reservations can be made with Maggiano's at (847) 933-9572. 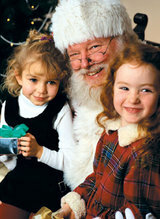 Throughout the season other Westfield Old Orchard retailers will host similar Breakfast with Santa events. Macy's offers numerous breakfast with Santa events at 9 a.m. on December 8, 9, 15, 16, 22, 23. The price is $17.95 for adults and $13.95 for children. Macy's reservations are accepted at (877) 556-2297. To celebrate the start of Hanukkah, Westfield Old Orchard will host a traditional lighting ceremony for patrons of the Jewish faith, 5:45 p.m. December 8. 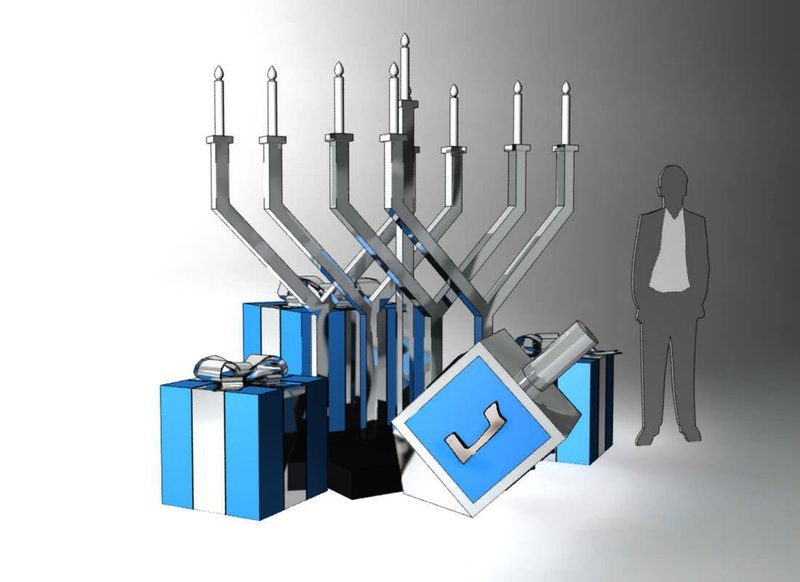 The 8 ft. menorah resembles other larger-than-life Magical Moments attractions displayed in the center's common area. The event will be facilitated by Beth Hillel of the Congregation Bnai Emunah. Enjoy the lively children's choir, hot beverages, sweet treats and a wonderful evening with family and friends. Stimulus Social Club and StreetWise Magazine are hosting a benefit with special guest Ed Swiderski III of TV's Bachelorette fame tomorrow night (December 5) at City Winery Chicago. The benefit begins 5:30 p.m. in the distinguished Concert Hall at 1200 W. Randolph. The cost is only $10 per person with proceeds benefit Streetwise. Streetwise benefit hosts are Veronica Resa, Olivia Pantoja, Kayla Klobe, & Carly Leviton. In 2012, Streetwise will have assisted more than 500 men and women in crisis. In executing its mission, Streetwise receives no government funding. The agency’s workforce development and social services are funded by private foundations and the generosity of individuals. The mission of Streetwise is to assist Chicago area men and women, who are facing homelessness, achieve personal stability by providing them with a combination of supportive social services and immediate access to gainful employment. StreetWise Magazine is the oldest operating street newspaper in North America. For more information, the public can visit the web: StreetWise.org or call 773-334-6600. Oh Olive, the olive oil authority at the Chicago French Market, is offering a variety of holiday bundles perfect for gift giving. The Butter Oil Popcorn Basket is a complete kit at $21.95. The natural, organic and vegan basket contains Oh Olive’s Butter Oil, popcorn and the shop’s gourmet seasoning blend. Whether shopping for family, friends, teachers or coworkers, this basket is the perfect healthy and delicious gift. Call ahead to reserve your basket and it will be ready to grab and go on your way home. The shop also is featuring its Black Cherry Balsamic for $17.95. When you pick up a bottle this holiday season, you will receive a complimentary recipe for Oh Olive’s signature Black Cherry Balsamic Brownies. Looking for a holiday spin on your favorite wines and juices? Oh Olive has created a blend of traditional mulling spices ($12.95) to dress up apple cider and cranberry juice for a tasty holiday drink. Also, pick up the Tiesta Tea Holiday Special at 3 for $21 containing the Oh Olive Blend, Minty Winter and Nutty Almond Crème ($3 savings).